The 2016 OOLALA winners are thought leaders who understand the importance of using technology to improve productivity and convenience across the entire prospect to resident lifecycle. 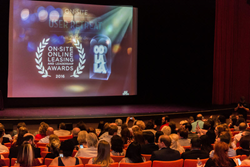 On-Site.com, top software provider for the apartment business, is proud to announce the winners of its first annual On-Site Online Leasing and Leadership Awards. The “OOLALAs” highlight On-Site partners who are generating exceptional business impact through their use of On-Site’s digital marketing and leasing platform. More than 100 nominations were submitted for the awards. Award winners were announced on March 3, 2016, during On-Site’s annual User Retreat in Palm Springs, CA. Founded in 1999 with technology and service 100% based in the U.S., On-Site is bringing the apartment industry up-to-speed with what today’s consumer expects from the renting experience: modern technology and a focus on usability. On-Site’s end-to-end platform covers everything from community marketing and renter qualification to lease contract generation with e-signatures and online storage, plus integrated communication hubs to drive resident retention after move-in. The result is a simplified rental experience that leads to greater customer satisfaction and translates directly to the positive side of the balance sheet. For more information about On Site’s online leasing solutions, visit http://www.on-site.com or contact one of On-Site’s online leasing experts at (855) 667-6500.